Chances are you’ve tried or at least heard of mochi. Even if you’re not an ice cream aficionado, it’s hard to escape all the hype mochi has received in recent years. It’s not undeserved either. If you’ve tried mochi, you know the sweet dough is the perfect complement to the tasty ice cream center. However, it took quite some time for this perfect dessert to come to fruition. Nowadays, people refer to mochi ice cream as simply mochi. However, using the shorthand you’re referring exclusively to the dough surrounding center. Mochi, a pounded rice cake, started the journey to the fusion dessert we’ve all come to know and love. A traditional japanese food, it is typically sold and eaten during the Japanese New Year. Traditional mochi is made during the mochitsuki ceremony where it is ceremoniously pounded. Two people work mashing and wetting the mochi, keeping a constant rhythm to avoid injuring one another. Two mochi-like desserts are cited as the beginning of mochi ice cream. Both feature mochi surrounding a sweet paste center and may have inspired the ice cream core of mochi desserts today. Daifuku has been around since the 18th century. A small round ball, mochi is filled with a sweet filling, typically red bean paste. It comes in three varieties: white mochi, pale green mochi, and pale pink mochi. The dough is covered in potato flour to keep it from sticking to hands and other mochis. Although mochi itself is a traditional Japanese food, Mantou finds it’s roots in China. Eventually, it made its way across the East China Sea and Japan made it their own. The mochi dough in manju is often flavored while the center is traditionally a sweet bean filling. However, manju can also have whole pieces of fruit, a mix of anko and fruit, or melon paste at its core. 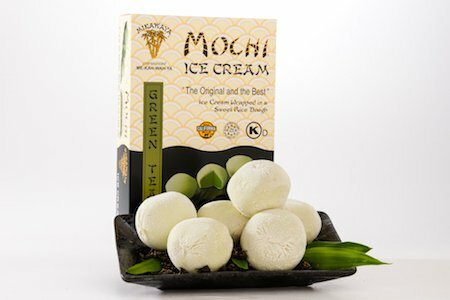 Mochi ice cream was first created in the 1980s and featured rice starch instead of sticky rice and rice milk instead of real ice cream. In the 1990s, My/Mo created mochi in its modern form. With a secret family recipe in our arsenal, we had the brilliant idea of wrapping our delicious mochi dough around dollops of ice cream. Over twenty years later, mochi is widely available across the United States. Featuring traditional flavors like red bean and green tea but also modern flavors like mint chip and double chocolate, mochi ice cream has become America’s favorite handheld frozen treat.